After two decades of promoting open and accountable budgets around the world, the fiscal transparency and accountability field has reached a critical juncture. Despite an impressive increase in public access to fiscal information and civic engagement on budget issues, many advocates and practitioners expected more: to bring tangible improvements to people’s lives through transforming public finance. Although fiscal transparency norms and standards have gained ground and, under some conditions, contributed to increasing budget allocations and spending on essential public services, there is a sense that quantifying the deeper impact of budget work remains elusive. This challenge calls for critical reflection and new ideas. That’s why earlier this year, the International Budget Partnership, the Transparency and Accountability Initiative, and the Carnegie Endowment for International Peace initiated a set of workshops under the theme of Fiscal Futures. Thirty-five fiscal transparency and accountability advocates, practitioners, scholars, and funders from 14 countries convened twice to review assumptions, rethink strategies, and imagine the future of public finance two decades from now. These workshops were centered around a creative scenario planning process designed to stimulate fresh thinking, venture beyond the limits of strategic plans, and practice decision-making under conditions of uncertainty. Before looking to the future, however, the Fiscal Futures team commissioned a research paper, available here, to take stock of where the field is now and what it has learned from the past. Why has progress on fiscal openness made so little difference in the lives of poor and marginalized communities? 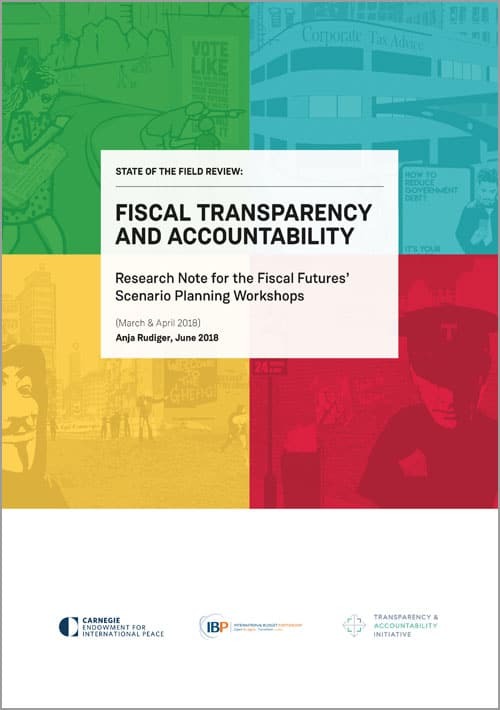 Through interviews with Fiscal Futures participants and other transparency and accountability experts, our research probed why the fiscal transparency and accountability field appears to have reached an impasse. What are the strategic questions civic actors are facing? Intensive field building since the turn of the century has resulted in a wealth of civil society initiatives monitoring budgets and advocating for greater transparency, participation, and accountability in public finance. Even so, our research found that the drive for open budgets has yet to be harnessed for a broader political project advancing equity and economic justice. To some extent, the field’s challenge lies in its success: the popularity of an apolitical transparency agenda and the large number of openness initiatives may have mitigated the field’s impulse to agree on deeper goals, investigate power relations, and develop strategic (as opposed to tactical) approaches. As long as governments continued signing on to transparency commitments and the field kept growing, there was little incentive for questioning the purpose of its core concepts, or for surfacing underlying values and political agendas. Yet facing a host of negative global trends —from democratic backsliding to rising inequality— the fiscal transparency and accountability field is at a crossroads. Should budget groups accept new political constraints and continue promoting transparency as a good governance fix? Or should they become more political, build countervailing power, and push for a transformation of public finance aligned with equity goals? There is no linear causal relationship between transparency and accountability. Disclosure of budget data is not a sufficient driver of fiscal accountability demands. Government responsiveness to accountability demands depends on political economy incentives and power dynamics. Accountability is a function of power, which civic actors can build through collective action and collaboration. To influence governments, an integrated campaigning approach with vertical and horizontal links across the fiscal accountability ecosystem is most effective; technical capacity building with governments is, at best, insufficient. Participation in budgeting is more impactful when linked to empowerment and redistributive goals, and less so when treated as a technical method to improve governance and civic engagement. Global standards and mechanisms can elicit some fiscal transparency gains at the country level, but also carry political risks, such as legitimizing questionable political regimes. Guided by these and other lessons, many in the field are rethinking the purpose of fiscal transparency and accountability. Is the goal to make public finance decisions more open? Is it to shape those decisions? Or is it about getting decisions that produce more equitable outcomes? Most interviewees were motivated by the latter goal and viewed transparency and participation as tools in the service of public resource redistribution. Consequently, they spoke of their struggles around changing power relations, building collective action, creating alignment across issues and sectors, and bringing public finance issues to bear on popular agendas. Could a normative understanding of fiscal accountability (e.g. accountability for meeting equity goals) more effectively transform public finance than a procedural understanding (e.g. accountability to certain stakeholders)? How do we change political will and systems? Through building countervailing power, challenging corporate influence, working with champions inside government, enacting institutional reforms and mandates? Or a combination of these strategies, depending on context? Can we drive collective action by flipping traditional budget work and starting with people’s needs and demands rather than with budget data? Could this entail support for long-term organizing and social movements? How do we build political and strategic alignment across the fiscal accountability ecosystem? Can we develop an integrated approach to public finance that pursues equity goals across revenue and spending measures? These questions interrogate the role of government power and fiscal governance vis-a-vis countervailing power, public engagement, and civic space. The scenario planning component of the Fiscal Futures initiative carried this theme forward, which we will illustrate in an upcoming post. The questions also hint at a potential normative turn in the fiscal transparency and accountability field: many of those interviewed for our research argued that for fiscal transparency and accountability initiatives to become more impactful and improve the lives of poor and marginalized communities, the field’s perspective has to expand beyond open and participatory budgets and move toward envisioning equitable and just fiscal policies. Digital age fiscal transparency requires designing digital age fiscal policy and monetary policy that facilitate re-discovering public finance and innovating new technologies. These are the reflection questions that have been seriously and furiously coursing through my mind 16 years on after heavily engaged in fiscal and budget transparency and accountability work… From the grassroots all the way up, subnational to global levels.